"Hubble has seen farther and sharper than any telescope before it." Okay, I have to admit, as a child of the 60s and a big fan of the space program, I was really excited to get this disc. Other than being far too brief, I wasn't disappointed one bit. DVD International delivers a wide variety of absolutely stunning images taken by the Hubble Space Telescope on this gorgeous disc. The images can be accompanied solely by music, in both DD 5.1 and DTS 5.1, or narration in one of four languages can be chosen as well. Alternatively, a subtitle track can be used to read the narration without getting in the way of the music. This is a splendid method of presentation that I was very pleased to see. The one shortcoming in the narration was that the first third of the program shows deep space images while describing the history of the Hubble Space Telescope and its various travails and upgrades over the years. During this section, we are left completely in the dark as to what it is we're viewing. The balance of the program, however, gives sufficient background in the images to appreciate them more fully. Most of the visuals are devoted to deep space shots, including various nebulae, distant galaxies and galactic clusters. These are static shots, but the point of view of presentation of the photos is always shifting, giving the sensation of seeing movement in the pictures. This greatly helps maintain interest. The last chapter, however, is devoted to time-lapse photography of the outer planets. Of particular interest are the fairly detailed shots of Mars and Jupiter. There are also quite amazing pictures of the planet Uranus, which had previously seemed rather nondescript. Wrapping this up are some fairly ill-defined but nonetheless intriguing shots of the mysterious planet (or planetoid) Pluto. Accompanying the program as the principal soundtrack is what appears to be a full album by the musical group 2002. This has a vague, rather innocuous and drifty new age feel to it, which is not inappropriate for the subject matter. It does greatly relax the listener to the point of nearly drifting off to sleep. The running time is an all-too-brief 55 minutes. I would have been much happier with a program twice as long; the brevity is the sole reason for the reduction in the substance grade. Image Transfer Review: The program is presented in anamorphic widescreen, and the colors and blacks are eye-popping throughout. This is one gorgeous picture. The time-lapse photography looks slightly digital, but that is obviously a function of the nature of the source material. As beautiful as anything I've ever seen on a television screen. Audio Transfer Review: As noted above, the soundtrack is pleasant but not earth-shattering. The 5.1 DD surround track is quite enveloping, and the bass, where present is solid. No hiss, noise or distortion was heard on any of the audio tracks. The music and the narration both come through cleanly. Extras Review: The extras are a little better than the usual fare from DVD International. The most prominent is a screen saver (in 4:3 format) which can be used on the DVD player, or in DVD/ROM format. The pictures from the main program cycle through randomly, with little explanatory subtitles identifying them briefly. The picture quality is quite good here as well. We get the usual set of previews, and a discography (complete with track listings and timings of each track) for 2002. Finally, there is a weblink for more information about the program. 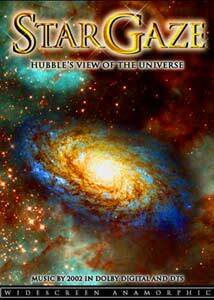 A truly stunning visual experience that will astonish you with the jaw-dropping beauty of the universe that has been completely invisible until now. Highly recommended.